Suitable for use in emergency systems, these Direct Current Automatic Transfer Switches are rated for applications of 100 thru 400 amperes, up to 125 Vdc with an interrupting rating of 10kAIC@250Vdc. 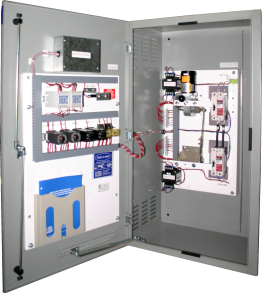 The Standard Direct Current (DC) Automatic Transfer Switch (ATS) utilizes and isolated motor to operate both the normal and emergency molded case units at the same time. Normally, the transfer switch operates on the preferred power source with the Normal molded case unit in the closed position and the Emergency molded case unit in the open position. For the standard version of this unit, a “Neutral” or “OFF” position is not available and the unit provides transfer to an emergency power source in the event of normal power source failure utilizing electromechanical controls.